Tiffany Zajas Photography: pretty clothes. I really love vintage finds and clothes that have been made by hand. Maybe one day I'll buy a sewing machine and learn to make my own clothes. If I didn't already have way too many hobbies I probably would already be doing this. I have mentioned before that I love the blog Grosgrain, because she is constantly displaying clothing she has made herself and other handmade or vintage finds...and I think it is lovely. I think these reusable grocery bags are adorable! 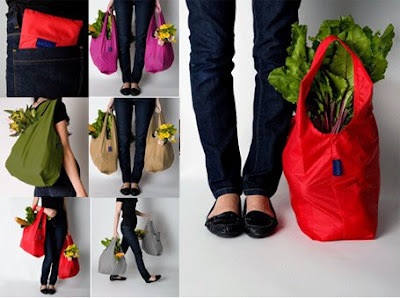 I might even use one as a purse on occasion! There's even one that has Abraham Lincoln's face on it! 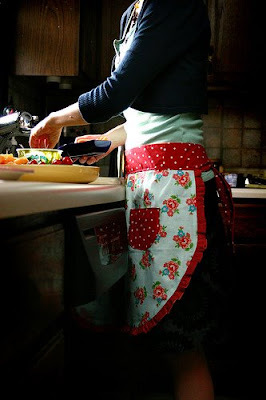 This tutorial on how to make your own apron is wonderful! Again, if I had a sewing machine, I would probably attempt to make something like this. I have been wanting to buy a nice, cute apron ever since Jonathan and I first got married. 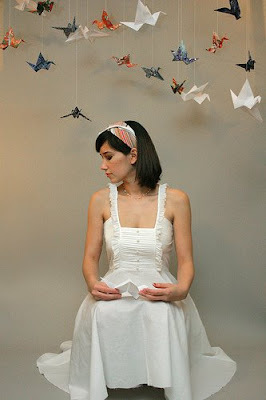 This dress is a vintage find that Kathleen altered and re purposed. I think it is the cutest thing ever! I would most definitely wear this. This white dress is oh-so-pretty and oh-so-simple. I picture this as being the perfect dress to wear while reading a book under a towering oak tree on a sunny spring day. Love it.